Pivots for all non-moving objects must be at the center of world coordinates (World 0,0,0), the local axis must match the world axis. Pivots for gauge needles and aircraft controls must be at the point of rotation with one axis pointed along the rotational axis. In order to easily animate them. Since these objects will be animated particular axis of rotation (local x,y or z) is not important. The model must contain 45-70K triangles for a single seat cockpit and 60-85K for a two seated cockpits. When making geometry, you should take into account the 360° camera view, as well as the fact that the game camera can move about 20-30cm in any direction from its neutral position. So you have to be careful to which invisible polygons are to be deleted when optimizing cockpit geometry. You may want to make a layer called «invisible» and store excessive polygons there (not to be exported). Faces without smoothing groups are not allowed. Even if it is a flat surface. Smoothing groups must be present on all faces. UV coordinates must not exceed +-7.0 in any direction. All faces must be mapped and have UV coordinates. Otherwise there will be conversion errors. It is a good practice, for ordinary geometry to have all mapping inside 0-1 UV space. Animation should be made in a 0 to 100 frame range for any animated object. A Note track is to be created in the Track View Dope Sheet with keys «start» at frame 0 and «finish» at frame 100 for one of the objects. For cockpits it is the throttle object. The game code reads the «start» and «finish» keys to determine the animation range. Use only Linear Position, Linear Rotation and Linear Scale animation controllers. Animation constraints are not allowed. The names for moving (animated) objects in the cockpit are in the table below. The table also lists the initial and final positions of controls and instrument needles. 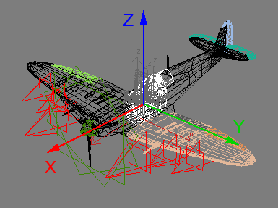 Number and availability of objects depends on the cockpit you are making. * - stick_ailerons should be parented to the stick_elevator. If the control stick is made of one object (and usually it is), it is necessary to create a stick_elevator fake object (an ordinary small box will do) and put it in the hinge point of the control stick joint. ** - pedals can be a complex parallelogram mechanism. In this case, all objects related to pedals need to be labeled pedals1, pedals2, pedals3 etc. *** - triggers on the control stick must be parented to stick_ailerons and named weapon1 (machine guns), weapon2 (cannons), weapon3 (bombs, rockets). **** - usually the speedometer has a nonlinear scale. It is necessary to animate the needle in order to display speed in a linear manner. For example, if the maximum speed according to the instrument is 500 km/h, then for every 2 frames the speed must increase by 10 km/h on the instrument. ***** - these names are assigned to billboards, which have an illuminated lamp texture. Several diffuse textures, normal and specular map textures are used for a model. Diffuse map (with or without an alpha channel) is a separate texture. Normal and specular maps share one texture with specular map placed in the alpha channel. Use optional textures carefully. For example if you have boxes texture with many text labels written on equipment - the remaining labels can be accommodated in the gauges texture. So we can skip creating separate labels texture. The rule is the fewer textures the better. glass_dmg texture is needed only when aircraft engine is located in front of the cockpit. Always use the power of 2 for texture sizes. Aspect can be nonsquare. But it is better to plan your texture layouts keeping square sizes in mind. Important! Please do not forget to add required post-fixes to files. As the engine uses them to choose compression method for a texture. You can find additional textures, used by cockpit in the sample model archive. The normal map and specular maps are the same size as the primary diffuse texture. Normal map uses RGB channels and Specular map uses an alpha channel. It is good to keep normal maps as bump (height maps) in your layered source document before the NormalMapFilter conversion. Converted (blue) normal maps in layers are better used only for minor corrections. Use filter default settings for height to normal map conversion: Min Z = 0, Scale = 8. The normal map Y (green) channel must NOT be inverted. You should get the following look after the NormalMapFilter conversion. Convex parts look as if they are lit from below. The normal map must include minor details and relief which is "expensive" to do with geometry: rivets, washers, etching, etc. The specular map should emphasize defects from everyday use of machinery: chips and scratches on the paint, traces of abrasion on bolts, rivets and ribs of metal parts. 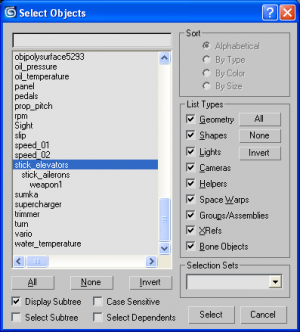 Cockpit objects must have have a single Multi/Sub-object material, named «cockpit» assigned to it. * - you can make separate Multi/Sub-Object, material for bullet holes. ** - you can make separate Multi/Sub-Object, material for lamp flares. Color and quantity may vary as necessary. No special material is required for glass_a_dmg texture. Because it is swapped in game with ordinary glass texture when oil radiator is damaged. Text labels with alpha cut letters are not allowed. Because alpha is eaten out quickly by texture mips. So the text becomes unreadable. «No degradation» flag is not available for cockpit textures. It has limited uses. uv – rendered uv template can go here. The topmost layer. Hidden by default. Layers may have sensible names which are easy to understand. For your convenience. In the example above Federal standard 595C colors are used for precise color description. Using the default layer names Layer 1, Layer 2 etc. may become uncomfortable in the long run. It is better not to rasterize text layers. So that they can be easily edited anytime. An ambient occlusion layer must be rendered at least for the primary cockpit texture. To have nice ambient shadows. You can use mental ray Renderer for these purposes. 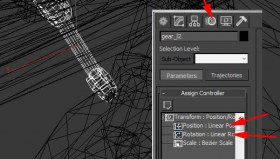 Select Ambient Occlusion (MR) when adding a component in the Output section of Render To Texture dialog. Use Edge Padding of 2 pixels. Play with mental ray Samples and Falloff parameters to get the desired look. Do not forget to switch to mental ray renderer in the Render Setup dialog window (F10). Ambient occlusion must be rendered against a white background. In Photoshop (or similar software) use «Multiply» layer blend and place AO layer group on top of the layer stack. Play with opacity, as you see fit to get a good looking result. It is advised not to overshadow the cockpit. Please note that there will be static shadows rendered in places where we do not want them to be. On moving control surfaces or under pedals for example. Keep this in mind. Such places will have to be adjusted manually. Glass bullet holes for damaged state are made with billboards placed near damaged surfaces (you can use texture provided with the sample model). Metal holes in the fuselage and instrument panel are made the same way. 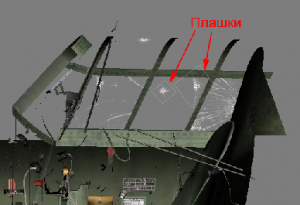 Player must get a visual notice when the aircraft is damaged. You can paint dirt on cockpit glass along the framework. With up to 40% opacity. Bare metal for chips and wear on the diffuse texture have to fall within 90-120 RGB range. Cockpit textures must not be clean. You can add traces of everyday use (wear & tear) with diffuse and specular textures for better realism. %aircraft_name%_cockpit.lod00.dag - aircraft cockpit and LOD0 file. Good luck and we can't wait to see what you make.